I picked it up tonight, paid a crisp C-note. Wifey is not happy that I dragged another thing home. This is my first non-running vehicle purchase. I’m excited to get it going. It has 1600 miles, and was last registered in 2009. Hopefully fresh gas/battery and a carb cleaning does the trick. 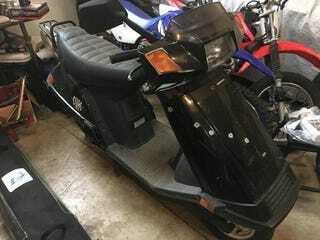 Not that I really need one, but a clean complete Honda Elite 80 for $150 would be fun to try and get going. It’s only a few miles away, so I’m going to check it out this weekend. I’ll probably offer a c-note. My buddy has proven that I can get around the no title thing by registering it in Vermont.